George Graham reviews Skyfoot's "Blindly On Through"
The jam band scene remains active though it has gone in various directions, with different groups drawing on disparate influences. Some may bring in some world music, some are influenced by bluegrass, some by jazz, and others by the blues. Some are mostly instrumental, and others can go in for articulate or elaborate lyrics. And among jam bands, there are definitely different levels of musicianship. Some can do their improvisation with solid multifaceted playing, and others go for the mood and atmosphere, that perhaps was enhanced by the medication of the audience. This week we have a new recording by a jam band that has a little of both aspects in their sound. They are called Skyfoot, and their current album, their third release is called Blindly On Through. 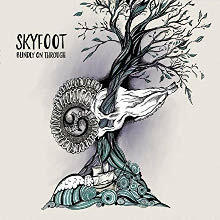 One can hear definite hints of the Grateful Dead in Skyfoot’s sound, but they also create some longer compositions in which the arrangements are more structured. But even on this studio recording, the band stretches out for some lengthier improvisational parts. Skyfoot is a quartet from Boston, with conventional instrumentation, guitar, keyboards, bass and drums. Their members are Eric McEwen on keyboards, Tyler Arnott on guitar, Aaron Morey on drums and a bassist named James Taylor. They released their first album Eternal Bend in 2012, and followed it up two years later with Room for Space. Now they are out with Blindly On Through, recorded in late 2018. And the nine rather lengthy tracks well represent the different facets of the group. One can clearly hear some Grateful Dead influence in the guitar style, and bits folk and country, but they oftentimes throw curves at the listener, so just when you thought the band would be jamming on a groove for a while, they’ll do some quick musical turns and go off in another direction sonically and stylistically in the context of the jam sections of the album’s tracks. Lyrically the band offers few insights, but there are some tunes that have interesting words, including a couple of love songs with mixed feelings. That is followed by Hurdy Gurdy, which starts a kind of electric country-bluegrass jam, before throwing a series of musical curves, during this, one of the album’s lengthiest tracks. Blindly On Through, the new third release by the Boston jam band Skyfoot, is pretty much all you would want in a studio album by a jam band. They maintain an improvisational bent even in the studio context, but they rise above most rock jam bands in their wealth of ideas when they do jam, rather than getting stuck in repetitious noodling as some in the genre tend to do. As mentioned, Skyfoot often changes musical direction unexpectedly to keep things interesting. Like most jam bands, they are probably not going to win any literature prizes for their lyrics, but they do well enough for the genre. The musicianship is quite good without being showy, and perhaps most importantly for a group like this, their music imparts a positive vibe, even in some of the songs of unrequited love. The band also likes to maintain a kind of musical continuum, with several of the tracks segueing and overlapping into one another. Our grade for sound quality is about an A-minus. It’s not at audiophile level, but things are pretty clean sonically, and they avoid dumb studio tricks. The dynamic range, how well the recording maintains the ebb and flow of volume of the band’s playing, is above average for these days of badly over-compressed sound, but compared to say a Phish recording of 20 or 25 years ago, the sound is fairly lifeless and flat. Most of the best jam band recordings are live ones, and Skyfoot has issued some live download and streaming recordings. But Skyfoot in the studio has come up with an enjoyable and edifying new CD.